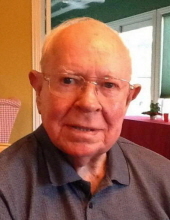 Alfred Lee Wilson, age 95, died Sunday, March 10, 2019, in Longview, Texas. Al was born September 15, 1923 in Daingerfield, Texas. His childhood was spent with his family following the sawmill trade throughout East Texas and Arkansas. A US Army WWII veteran, Al served as a tank crewman, 3rd Armored Division, Spearhead Group, landing on Omaha Beach June 23, 1944. Formerly of Thorofare, New Jersey, Port Richey, Florida and most recently of Diana, Texas, Al retired from Sheet Metal Workers Local 19, Philadelphia, PA in 1988 and was a former member of the Thorofare Fire Company. Al was very mechanically inclined and could fix most anything. He enjoyed working on his cars, always keeping them in tip top condition. Predeceased by parents Blanch and Ola Mae (Fowler) Wilson, brothers Blanch, Jadie Carl (JC), Sebe and daughter Constance Marie. Survived by son Ronald (Cindy) Wilson, Thorofare, New Jersey, Son-in-law Francis McCrystal, Auburndale, Florida, nieces Leigh (Rick) Burgy, Diana, Texas, Dot Walker, Jefferson, Texas and Frances (Alton) Hambrick, Ojai, California. Also survived by eight grandchildren and five great grandchildren in Florida and New Jersey and his canine companion Berkley. Al was a true gentleman and was loved by many. He will be greatly missed. Graveside military services to be held at Dallas Forth Worth National Military Cemetery at a later date. To send flowers or a remembrance gift to the family of Alfred Lee Wilson, please visit our Tribute Store. "Email Address" would like to share the life celebration of Alfred Lee Wilson. Click on the "link" to go to share a favorite memory or leave a condolence message for the family.